2015 TIARA 45 SOVRAN FREQUENTSEA is a late model, low hour opportunity on the ever popular 45 Tiara Sovran model. Powered by Volvo IPS 600’s with joy stick controls, the SOVRAN 4500 is easy to handle, efficient to run and fun for the whole family. This 2015 TIARA 45 SOVRAN has an extremely social and versatile layout. Loaded with factory options and custom equipment, FREQUENTSEA is a fine example of a TIARA 45 SOVRAN. This 2015 TIARA 45 SOVRAN has an extremely knowledgeable owner and is professionally maintained to the highest of standards. If you are in the market for a late model, premium brand, express cruiser, you should absolutely consider 2015 TIARA 45 SOVRAN FREQUENTSEA. I appreciate the opportunity to earn your trust and business. Aft enclosure between top deck and lower deck, matching navy blue with sliding door in lieu of roll up door. Zip in screen. Windshield cover. Full cockpit canvas for button up weather protection. The 45 Tiara Sovran FREQUENTSEA can be easily boarded by the swim platform on a floating dock or on either aft quarter on a fixed pier. Once aboard you can’t help but be impressed with the very social well laid out cockpit area. There is comfortable aft wrap around seating aft and additional seating port side forward. The fiberglass table folds to make maneuvering easier. A custom made Isinglass panel separates the lower cockpit from the helm area. A sliding Isinglass door was added instead of a roll up curtain. As you make the step up from one level to the next, there is a sink and refrigerator to starboard. Once on the air conditioned helm deck there is a large U shaped seating area to port with a fiberglass table. This area is raised so visibility is very good while you cruise in comfort. Across from the seating area is the helm station. Her navigation equipment features the latest 8000 series Garmin screens, GPS, Radar, depth, SAT weather, SAT TV and more. Center line forward on the helm deck is the sliding door to the salon, galley and accommodations. After going down a few stairs you find yourself in the belly of the salon with the galley to port and salon seating to starboard. The aft bulkhead to starboard has storage and a combo washer dyer unit added. The salon TV is on a center line bulkhead which also gives some separation to galley while still maintaining an open spacious feel. Through the galley aft is the guest stateroom with twin berths and a head. Through the salon forward is the master stateroom with private head. Finally, there is a nice sun pad out on the bow for lounging. "FREQUENTSEA" has the must have high dollar hydraulic swim platform and access to the engine room is through the hydraulically actuated aft cockpit. Personal belongings and fishing gear are excluded from the sale. 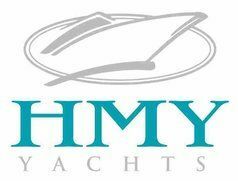 Andre Båter fra HMY Yacht Sales, Inc.
Vis alle Båter fra HMY Yacht Sales, Inc.